in the gray wash of autumn. each day joins the world’s cathedral of time. Moments are the common books we paste ourselves into. the way we build symphonies from the tune up. listing along the chords our limbs are singing. Our bodies are water and birds, churning and flight. Death sits alone at the back of the lab. they are no longer pigs inside their flimsy bags. the only connection to their bodies. Each day for weeks there are more incisions. The miraculous blue and red tubes. The shadows of a heart and lungs. under a stretched dome of skin. The belly opening like a horrible story. Everything so tidy, so intricately formed. some vital source she senses but never sees. 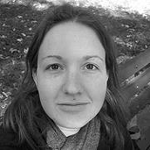 Rebecca Macijeski is a Doctoral Candidate at the University of Nebraska and holds an MFA from Vermont College of Fine Arts. She currently serves as an Assistant Editor in Poetry for Hunger Mountain and Prairie Schooner. She has attended artist residencies with The Ragdale Foundation and Art Farm Nebraska. Poems have appeared or are forthcoming in Poet Lore, Potomac Review, Painted Bride Quarterly, Rappahannock Review, Nimrod, Sycamore Review, Gargoyle, Tinderbox Poetry Journal, Storyscape, Border Crossing, and others.